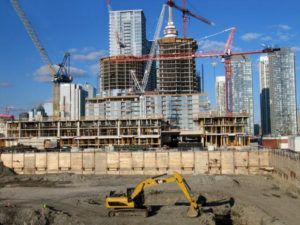 In recent years, North Africa has been the region with the greatest investment in the Heavy Clay industry. Among them, the largest percentage of new manufacturing facilities has taken place in Algeria. The different government homebuilding programs make Algeria still a country with a significant need in this matter. In 2005 there were over 80 active brick plants in the Algerian market, producing around 7,000,000 tonnes/year, whereas in 2017 the figure was close to 180 plants producing over 25,000,000 tonnes/year. 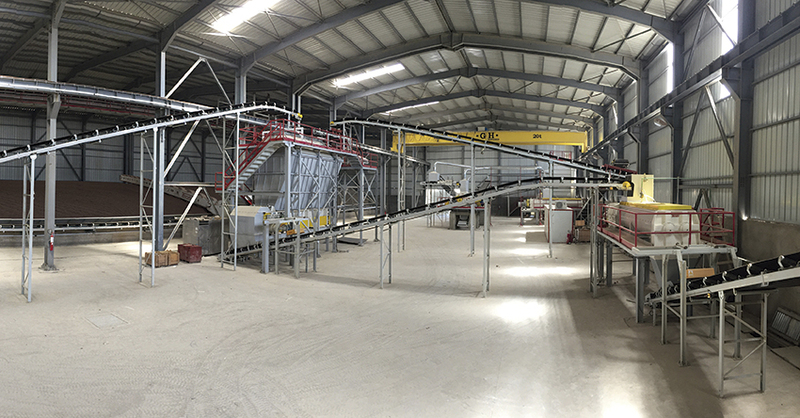 Some of these new plants in operation today, have been designed for a a clay brick production capacity of up to 700,000 tonnes/year. In addition, there are as many as thirty plants which are either under construction, just getting started and/or are securing funding. 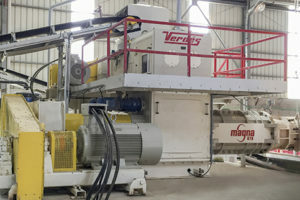 More than half of these new plants have been supplied and installed by VERDES, with the support of its subsidiary VERDES Al-Djazair, which supplied after-sales service and supplies duly imported original spare parts in the local currency, making the Spanish brand the leading provider of preparation and moulding production lines, either for the traditional wet method but also for the dry, a VERDES exclusive feature. 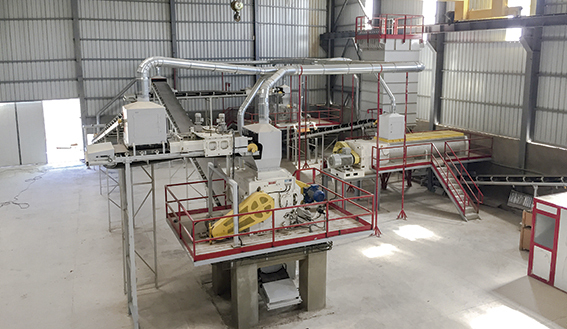 TALLERES FELIPE VERDES, S.A has recently start-up a new plant, EURL MOULIN OULED MAALAH in Mostaganem, with a nominal capacity of 270,000 tonnes/year, or 794 tonnes/day, based on a rate of 91 tonnes/hour for the preparation line with two working shifts, and 69 tonnes/hour for the moulding line based on three working shifts. 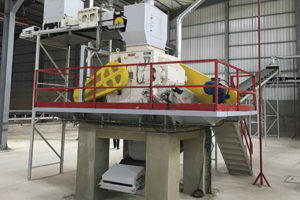 The preparation line has been set by semi-wet method, with the first pre-grinding installation in Algeria with open air stacking, via a 118 DT primary crusher with a capacity of 150 tonnes/hour. The air storage volume is approximately 12,000 m³. 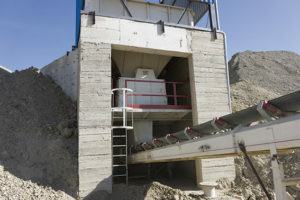 The clay is received by a box feeder that supplies a secondary grinder: a disintegrator model 127C, Ø1000×1000 mm, with a capacity of 100 tonnes/hour. 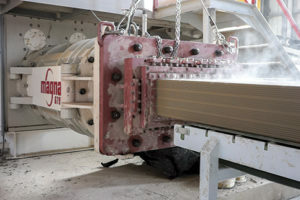 After that the clay is conveyed to a third grinder, a next-generation OPTIMA 1000 B roller mill with a 3.5 to 4 mm gap. 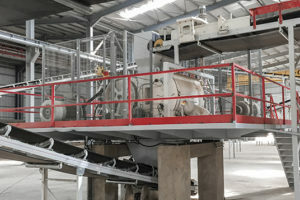 The clay and sand are then discharged into a 046 C double shaft mixer to be either mixed or delivered to the storage room. 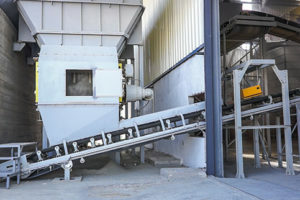 A reclaimer model DRAVH 14.7/65/1200, collects the homogenised clay that is conveyed to the shaping area, via a box feeder, to a second 046 C double shaft mixer, and after that towards an OPTIMA 1200B roller mill with a gap from 1.5 to 1.2 mm. 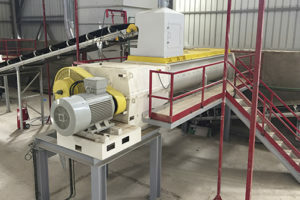 The extruder is a MAGNA 675/50 with conical augers, in 26% to 28% chromium alloy, with a production capacity of 69 tonnes/hour, a working pressure of 20 to 22 bar, and approximately 20% humidity, which facilitates and saves time and of course the cost of drying. 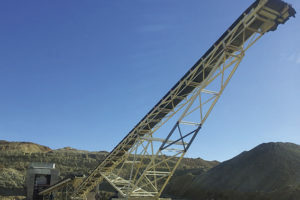 The EURL MOULIN OULED MAALAH has been in operation since the beginning of December 2017. 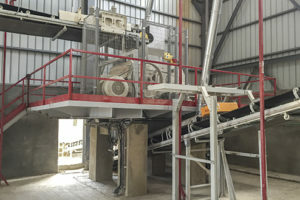 TALLERES FELIPE VERDES has other plants to be commissioned in the next months; a plant in Laghouat (Briqueterie Moderne Amouri Laghouat or BMAL) with a capacity of 700,000 tonnes/year; an upgrade in Djelfa (PROGEC MAC II) with the installation of a second hammer mill, an automated storage room with Reclaimer, and a second preparation line to double the current production of 140,000 to 280,000 tonnes/year; as well as a new line, also on the west coast (Briqueterie TAMAZOURA) with a capacity of 280,000 tonnes/year. Besides all this recent productive activity in the Algerian Heavy Clay Market, it should be noted that Verdés has also supplied in 2017 several machines in France, Belgium, Malaysia, Saudi Arabia, the Russian Federation, and Colombia, among others.